The I-105/I-110 interchange in Los Angeles links the Glenn Anderson (Century) Freeway-Transitway with the heavily traveled Harbor freeway. This is the first intermodal interchange in California with vertical transferability accommodating cars, vanpools/carpool/buses/light rail. It has three levels of transfer facilities, including direct HOV connectors between the two freeways. 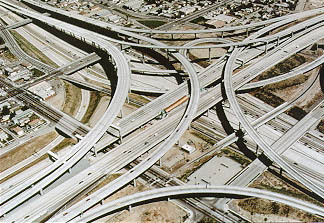 The design of this interchange addressed congestion, safety, and air quality. Numerous designers and contractors worked on this complex project and saw it completed in 1993.